This view shows sharp detail of a scarp at the head of Chasma Boreale, a large trough cut by erosion into the martian north polar cap and the layered material beneath the ice cap. The picture is a mosaic of two images acquired in January 2005 by the Mars Orbiter Camera on NASA's Mars Global Surveyor, using a resolution-enhancing technique called "compensated pitch and roll targeted observation." The camera team considers this the best pair of images yet acquired using that technique. During each northern summer on Mars, there occurs a narrow window in time of two to three months when conditions are ideal to image the north polar cap at high resolution. Throughout this period, the atmosphere is generally clear over the cap, and the seasonal carbon-dioxide frost from the previous winter and spring has sublimed away, permitting a good view of the surface geology. The two images in this mosaic were acquired during this brief period during the most recent northern summer. Within a few weeks of when these images were acquired, dust storm activity picked up in the north polar region, making the atmosphere too dusty to obtain any more detailed views until late 2006. Chasma Boreale is cut into the layered material that lies beneath the water ice of the north polar cap. For decades, these layered materials were assumed to consist of a mixture of ice and dust. Mars Orbiter Camera images obtained in 1999 and 2001 began to show that some of the layers are a source for windblown sand. The science objective for the two images shown in this mosaic was to look for boulders in the debris shed from the steep slopes cut into the north polar layers by Chasma Boreale. Finding boulders would imply that the layers that are the most resistant to erosion in the polar region are as competent as solid rock, perhaps giving a new insight into the nature of the polar layered materials. The pictured site is near 84.8 degrees north latitude, 356.4 degrees west longitude. Examination of the high-resolution mosaic shows that there are indeed some large boulders that have eroded out of the layered materials and rolled down the slopes. It is possible, therefore, that the north polar layers are not simply a mixture of ice, dust, and sand. Some layers may actually be rock, cemented by minerals rather than by ice. Alternatively, if the materials are cemented by ice, then a future high-resolution view might show that the boulders have become smaller over time. In addition to the observation of boulders eroding out of the polar layered materials, the mosaic also helps confirm that dark sand is eroding out of the polar layered materials, and that there are three different groups of layers under the polar ice. The upper unit is light-toned, finely layered, and more resistant to erosion (more competent, less easily destroyed by erosion) than the middle unit, which is rich in dark sand but also has several shelf-forming layers in it. Finally, below the dark, sandy layer is a third unit that is light-toned and has a different appearance relative to the other two units. Some of its layers have surfaces that have been broken by shallow fractures into polygonal and linear forms, also implying that they are hard, resistant rock. The level of detail seen in the mosaic was made possible by the development of a resolution-enhancing technique for using the Mars Orbiter Camera. During 2003 and 2004, the Mars Orbiter Camera operations team at Malin Space Science Systems, San Diego, Calif., worked closely with the Mars Global Surveyor operations teams at the Jet Propulsion Laboratory, Pasadena, Calif., and Lockheed Martin Space Systems, Denver, Colo., to develop a new technique in which the spacecraft does a maneuver that permits the camera to acquire images at a higher spatial resolution than normal. Usually, Mars Orbiter Camera images have a resolution of about 1.5 meters (5 feet) per pixel, and the camera can be commanded to acquire lower resolution data when desired. To obtain a higher resolution, the whole spacecraft must be pitched at such a rate that the camera over-samples its view of the martian surface in the down-track direction. Called compensated pitch and roll targeted observation, or cPROTO, this technique allows Mars Orbiter Camera to obtain images that have a resolution of about 50 centimeters (20 inches) per pixel in the down-track direction, and 150 centimeters (5 feet) per pixel in the cross-track dimension. The Mars Orbiter Camera was built and is operated by Malin Space Science Systems, San Diego, Calif. Mars Global Surveyor left Earth on Nov. 7, 1996, and began orbiting Mars on Sept. 12, 1997. 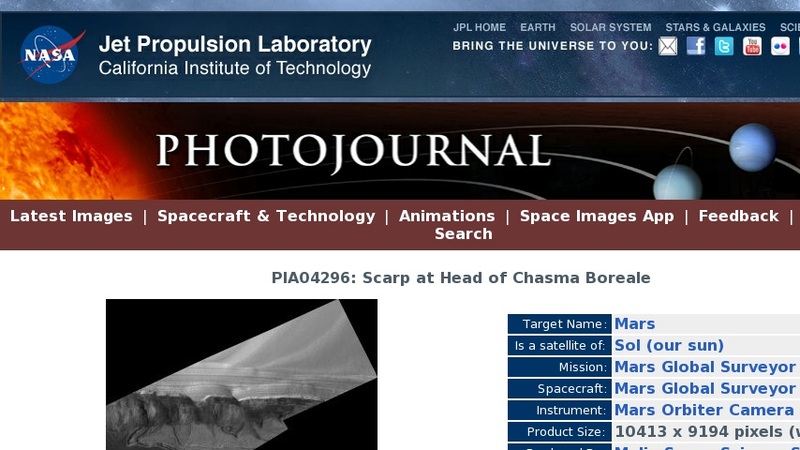 JPL, a division of the California Institute of Technology, Pasadena, manages Mars Global Surveyor for NASA's Science Mission Directorate, Washington.